[June 15, 2014] The two senior leaders could not be more different. Iraq’s Prime Minister Nuri Al-Maliki and ISIS’s leader Abu Bakr al-Baghdadi are two sides of a very long and often brutal clash within the Muslim faith. It is not surprising then, that Iraq’s senior leadership contrast will overshadow the final confrontation. 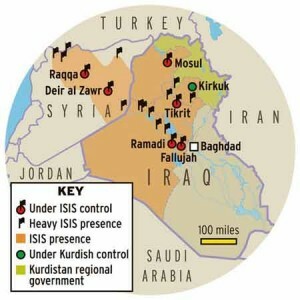 This will be a conflict between Al-Maliki’s Shia-dominated government and al-Baghdadi’s Sunni Jihadist militant group. Iraq’s federal government is an Islamic, parliamentary republic. It is democratic only in the sense that elections are held. It is corrupt, inefficient, often ineffective, and indifferent to its Kurd and Sunni populations. PM Al-Maliki, a self-centered man, is the source of much of the problem and has been a thorn in the side of the U.S. during his time in office. His focus is getting as much as he can for the Shia population and everyone else be damned. The ISIS Jihadist group’s internal apparatus is a lot less clear. We know that its Sunni leader al-Baghdadi is ruthless and very effective. Back in January of this year, he made his intentions known. In a rare radio message, he stated his group’s intention was to march on Baghdad. Then he would move into “direct confrontation” with the United States.1 ISIS learned many lessons in its battles in Syria that has helped in its drive toward Baghdad. The civilized world waits, for there is little it can do that would be effective.